Information about construction, energy, power, conservation. As well as the occasional photograph and outlandish dream. Also including a time log of progress on the construction. (See what's new to track changes.) This is a guide for ourselves, our friends, but most importantly our architects and contractors. It is a history of the house building project as well as a working document on our plans and our questions that we need to resolve as we move forward. To simplify keeping up to date with changes, the original page has been subdivided into multiple pages. Each may be reached from the others. This and several other pages were revised in June, 2002 to reflect that we are actually building the house. 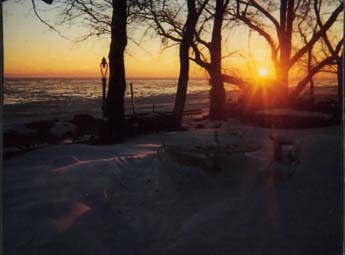 Summer sunrise, daytime, and winter sunrise over the lake. 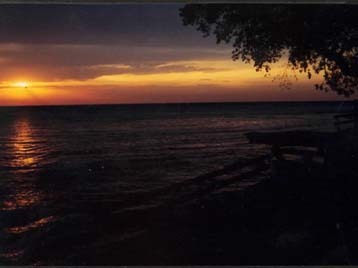 An unexpected additional benefit is the full moon rise over the lake (not shown). The "great room" of the former house was clearly meant for parties but did not take advantage of the location at all. As is true of all web pages, this is part of a constantly growing set of pages. If working off of a printed copy, it is useful to look at the date of the last version. As changes are added to the various pages on, the "What's New" page will track changes.